Homozygous Polled, moderate birthweight, and top 1% of the breed for growth! 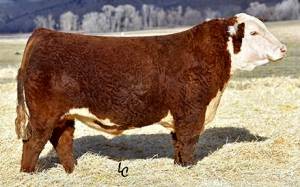 Stud is a powerful, deep sided bull with tremendous hindquarter, yet still is neatly designed about his head, neck, and shoulder. Stud was the high selling bull at the 2014 National Western Sale at $100,000!